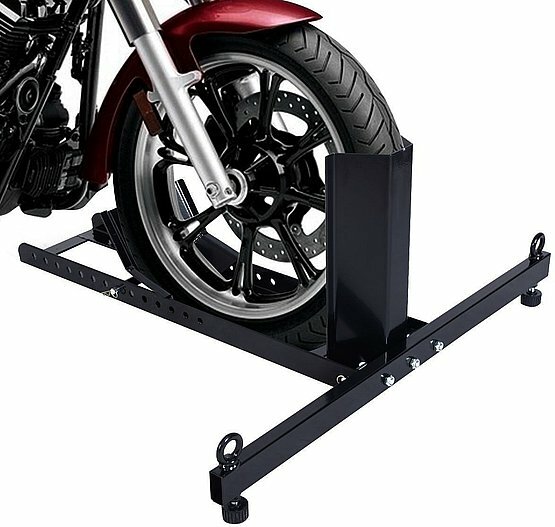 Here's a link I found today to a sturdy motorcycle stand you can whack out in a coupla hours or an easy arvo with basic tools. You will note after the article there's a download page for the plans, and if you like to take things further, a metal tyre stop for the front end. "Here's a link I found today to a sturdy motorcycle stand you can whack out in a coupla hours or an easy arvo with basic tools. Can't ask there because the original is locked, but how do I get my bike on and off the stand? You can get folding aluminum ramps these days for $60. You'd probably need two people to push it up. But it wouldn't work with any of your bikes anyway .75, it's for cafe racers. I think with the shortened rear end and clip-ons of the cafe's you just throw the bike up much like would a motocross bike. Just a guess anyway. There's a aluminium ramp pictured up against the wall in one of the images. 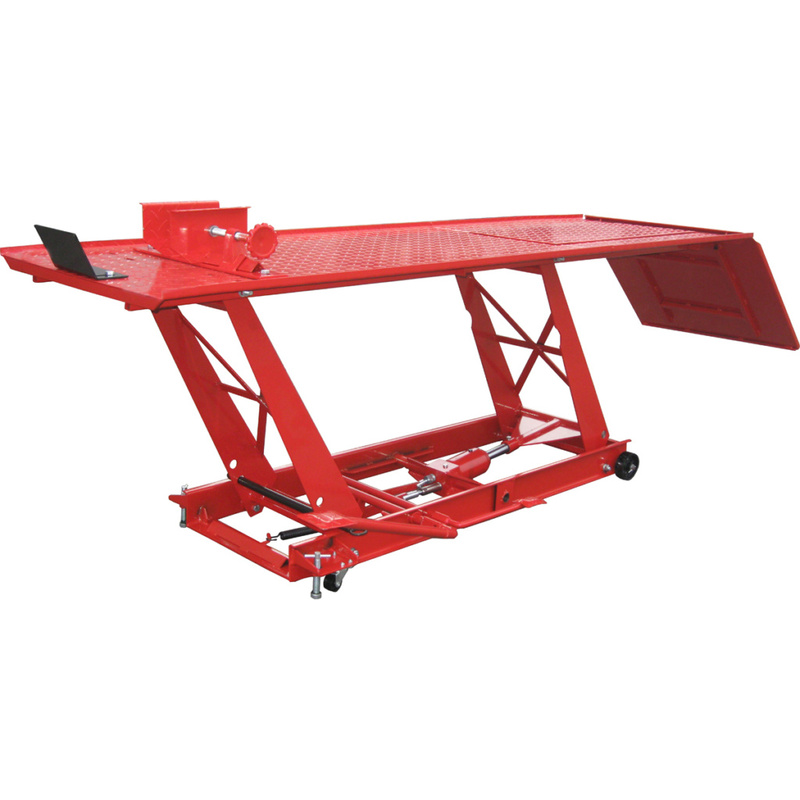 It's certainly sturdy enough for a 500-plus pound machine, and you get to make it as long as you need it to be. My mate Bob uses one he built from timber for his workshop. A customer's Moto Guzzi Eldorado Winter resto project is currently parked on it. He, like me, uses a Harbor Freight foot pump workstation lift for bikes requiring more immediate attention. Less than $300 on sale a coupla years ago. Even my K13 rests nicely on it. 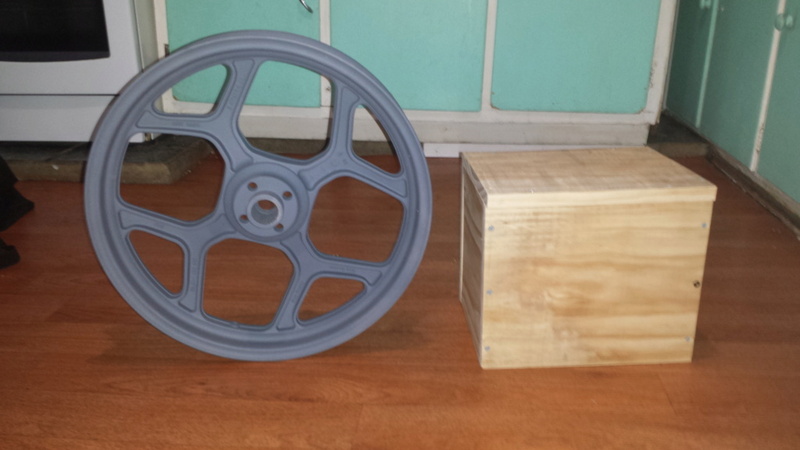 @duck wrote: You can get folding aluminum ramps these days for $60. You'd probably need two people to push it up. And getting it off is real easy. @Point-Seven-five wrote: Can't ask there because the original is locked, but how do I get my bike on and off the stand? You use a chain hoist attached to a beam trolley. I was interested to read the wiring article elsewhere in the link. Note the address "return of..." - had they gone away? There is also a pic of a young fella leaning lovingly over cafe racer (his? probably not) with... you guessed it ... obligatory hipster beard ... wearing disposable shoes covers! Charlie, that looks a lot like mine, a pile of 2x10 cutoffs scrounged from a construction site. The top piece has a hole drilled in it to accommodate the oil drain plug. @Point-Seven-five wrote: Charlie, that looks a lot like mine, a pile of 2x10 cutoffs scrounged from a construction site. The top piece has a hole drilled in it to accommodate the oil drain plug. @GF Wollongong wrote: There is also a pic of a young fella leaning lovingly over cafe racer (his? probably not)... wearing disposable shoes covers! Perhaps the area is considered a crime scene. Since I recently hurt my right foot I bought one of these for $55 on Ebay for doing upright maintenance until I can use a center stand again. I can also use my MC trailer as a bike stand if I want to swap center stands or whatever.